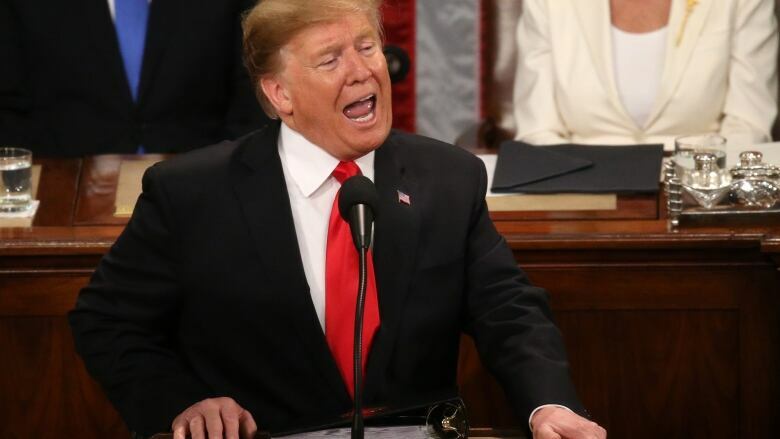 U.S. President Donald Trump struck a tone of unity as he began his state of the union speech on Tuesday night — the first he has delivered to a divided Congress — before turning to a lengthy defence of his call for a border wall, one of the most polarizing issues of his time in office. Trump's primetime address comes at a critical moment in his presidency. He recently pushed his party into a 35-day government shutdown over border security only to cave to Democrats, temporarily reopening the government without the $5.7 billion he was demanding in return to build a wall on the border with Mexico. Speaking before both supporters and political opponents in the House chamber, Trump said the agenda he was presenting wasn't Republican or Democratic. "It's the agenda of the American people," he said as he began his address, which was delayed by the partial government shutdown. As he stood before assembled lawmakers, Supreme Court justices, his cabinet and guests, Trump said there is a new opportunity in American politics — and that victory is not winning for one's party but for the country. He also called for a rejection of the "politics of revenge." "Together, we can break decades of political stalemate. We can bridge old divisions, heal old wounds, build new coalitions, forge new solutions and unlock the extraordinary promise of America's future. The decision is ours to make." WATCH: Trump uses his address to call on Americans to reject the politics of revenge. Without mentioning the shutdown, he said, "We must choose between greatness or gridlock, results or resistance, vision or vengeance, incredible progress or pointless destruction. Tonight, I ask you to choose greatness." With another shutdown deadline coming Feb. 15, the president has few options for getting Congress to fund the wall, and risks further alienating some in his party if he tries to circumvent lawmakers by declaring a national emergency instead. Border security and immigration were central to the speech, which ran well over an hour. The president said legal immigrants enrich the nation and strengthen society — but the issue of illegal immigration dominated the day as the president warned of a "tremendous onslaught" he says is coming to the southern border. Democrats oppose the wall and dispute Trump's characterization of the situation along the border, a message House Speaker Nancy Pelosi reiterated in a statement released after the speech. "It will take days to fact-check all the misrepresentations that the president made tonight," Pelosi said, adding that instead of "fear-mongering and manufacturing a crisis at the border," the president should sign a bipartisan bill that would keep government open and provide a range of border security solutions. Foreign policy was another key point, as the president touched on everything from Syria and Afghanistan to tense trade ties with China. The president's planned withdrawal from conflict zones has sparked conflict within his own party, with many Republican senators warning of problems that could follow a "precipitous" withdrawal of troops. "Great nations do not fight endless wars," said Trump, adding that the U.S. is working alongside allies to "destroy the remnants of ISIS." The address also included a formal announcement of a second summit with North Korea's Kim Jong-un, which is slated to take place in Vietnam at the end of the month. Tuesday's address was Trump's first state of the union since Democrats took control of the House of Representatives in the midterm elections, putting many of his rivals in the room. Per tradition, Pelosi, who was praised by Democrats for her hardline negotiating during the shutdown, sat behind the president, right over his shoulder. 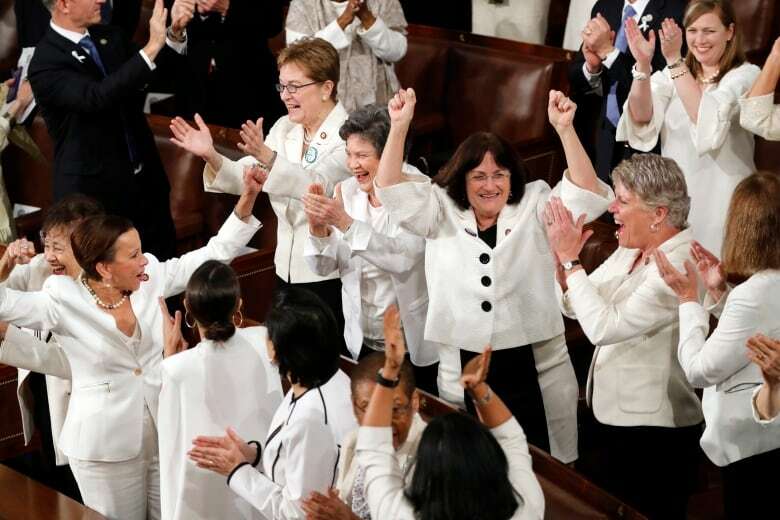 She was among the large number of women in the house chamber — many of them wearing white, the colour favoured by the 19th century suffragettes — who stood and cheered as Trump highlighted the number of women now in both the U.S. workforce and political office. "All Americans can be proud that we have more women in the workforce than ever before — and exactly one century after Congress passed the Constitutional Amendment giving women the right to vote, we also have more women serving in Congress than ever before," he said to cheers and chants of U-S-A! U-S-A! According to an Associated Press fact-check, Trump's statements about the number of women in the workforce weren't entirely accurate. There are more women working than ever before. But that's due to population growth, not something that Trump can credit to any his policies. As for whether a greater percentage of women is working or searching for a job than at any point in history, AP said women have seen better days. According to the U.S. Labour Department, women's labour force participation rate right now is 57.5 per cent. The rate was higher in 2012 and peaked in 2000 at roughly 60 per cent. Even as Trump extolled the state of the U.S. economy — which has been growing and adding jobs — he used the opportunity to make a veiled attack on investigations by the special counsel, Robert Mueller, and others. "The only thing that can stop [the economy]," he said, "are foolish wars, politics or ridiculous partisan investigations." 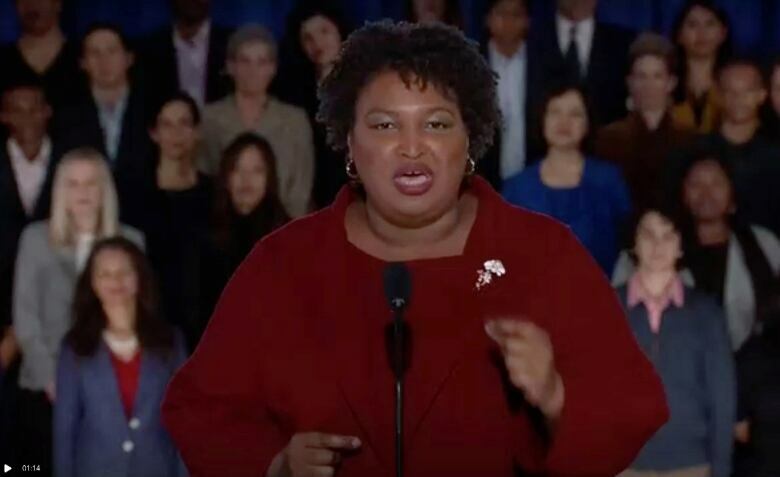 Democrat Stacey Abrams delivered her party's response to Trump. Abrams narrowly lost her bid in November to become America's first black female governor, and party leaders are aggressively recruiting her to run for U.S. Senate from Georgia. She talked about her own upbringing and how her family taught her that there was great opportunity, but that no one succeeds alone. She called the shutdown "a stunt" engineered by the president. But she said in times of division, people must come together. "So, even as I am very disappointed by the president's approach to our problems, I still don't want him to fail. But we need him to tell the truth, and to respect his duties and respect the extraordinary will create a stronger America together." Among Trump's guests for the speech were Alice Marie Johnson, a 63-year-old woman whose life sentence for drug offences was commuted by the president, and Joshua Trump, a sixth-grade student from Wilmington, Del., who was allegedly bullied because of his last name. They were sitting with Melania Trump during the address. An earlier version of this story incorrectly named Trump's guest for the speech as Anna Marie Johnson. In fact, his guest is named Alice Marie Johnson.